Nikon just announced eight new Coolpix models, including the company's first compact camera with a fast f/1.8 lens, the Coolpix P300, and a new 36x zoom model for maximum telephoto power, the Coolpix P500. In addition to the super-fast f/1.8 lens, the high-end 12.2MP Coolpix P300 has a 4.2x zoom that starts at a wider-than-average 24mm to help with scenic vistas and group photos. What makes a fast lens desirable is enhanced ability to shoot in low light, and to use higher shutter speeds to stop fast action, Canon, Panasonic, Olympus and Samsung have all offered compact cameras with fast lenses, but Nikon was noticeably missing from this category until now. 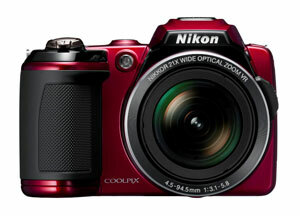 The Coolpix P300 offers extensive manual controls along with one-click panorama shooting and in-camera high dynamic range photography, combining several exposures to maintain detail in both the dark and light areas of a high-contrast scene. It takes 1080p movies with stereo sound. The lightweight (6.7 oz.) camera will sell for $329.95, starting in March. 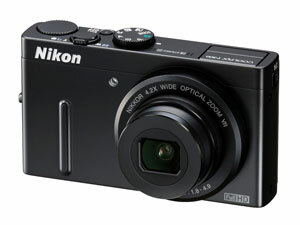 Nikon also introduced three new models in the ultra-zoom category, the Coolpix P500 with a 36x lens and a $399.95 pricetag, the L120 (21x zoom, $279.95) and the S9100 (18x Zoom, $329.95). The Coolpix P500 is a relatively large camera, shaped like a traditional SLR, while the S9100 is noteworthy for the surprisingly compact body housing all that zoomy goodness. The other four cameras in today's announcement are incremental updates at more affordable prices. 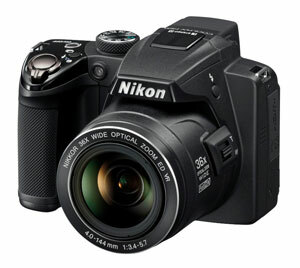 The S6100 ($199.95) continues the company's successful touch-screen line, boosting resolution to 16 megapixels. The S4100 and S3100 are fundamentally the same camera, with 14-megapixel resolution and 5x zoom lenses, but the $179.95 S4100 has a 3-inch touch-screen, while the S3100 comes with a standard 2.7-inch LCD. Finally, the L24 aims to please bargain-hunters, with a list price of just $119.95 for a Nikon with 14-megapixel resolution and a 3.6x zoom.